Best known as a founding member (with Mike Scott) of the folk rockgroup, The Waterboys and later as a long-standing member of Irish rock band The Saw Doctors. BRITISH MUlti instrumentalist Anthony “Anto” Thistlethwaite was (born 31 August 1955, Lutterworth, Englan. He started out busking in Paris, playing tenor saxophone around the streets of the Latin Quarter, in 1980 Thistlethwaite moved to London and in 1981 he played saxophone onRobyn Hitchcock’s Groovy Decay album as well as Nikki Sudden’s Waiting on Egypt. Mike Scott heard the saxophone solo on Nikki’s “Johnny Smiled Slowly” and invited Thistlethwaite to come and play with his fledgling band “The Red and The Black”. Their first record together “A Girl Called Johnny” was to be released as The Waterboys’ first single in March 1983 and featured Thistlethwaite’s tenor sax howl.Although Thistlethwaite is mainly known as a saxophonist he has also featured on mandolin, harmonica, Hammond organ, guitar andbass with The Waterboys and other acts. During the 1980s and 90s he also featured on recordings by: World Party, Fairground Attraction, Psychedelic Furs, Sharon Shannon, Bob Dylan, China Crisis, Johnny Thunders, Donovan, The Vibrators, Chris De Burgh,Bruce Foxton, The Mission, and others as a session musician.During the 1990s which included contributions from the likes of: Kirsty MacColl, Eddi Reader and Ralph McTell as well as many musicians including (‘Rolling Stones’ guitarist) Mick Taylor and Sonny Landreth. His third album Crawfish and Caviar consisted of songs recorded in St. Petersburg, Russia and Louisiana. For the past twelve years Thistlethwaite has been a full-time member of The Saw Doctors from County Galway, Republic of Ireland.Sharon Shannon, also a member of The Waterboys, recorded a song that she named “Anto’s Cajun Cousins”, after his Louisiana Thistlethwaite relatives, on her eponymous debut album. The Waterboys were formed in 1983 by Mike Scott. The band’s membership, past and present, has been composed mainly of musicians from Scotland, Ireland and England. Edinburgh, London, Dublin, Spiddal, New York, and Findhorn have all served as homes for the group. The band has played in a number of different styles, but their music is a mix of Celtic folk music with rock and roll. After ten years of recording and touring, they dissolved in 1993 and Scott pursued a solo career. They reformed in 2000, and continue to release albums and tour worldwide. Scott emphasises a continuity between The Waterboys and his solo work, saying that “To me there’s no difference between Mike Scott and the Waterboys; they both mean the same thing. They mean myself and whoever are my current travelling musical companions.”The early Waterboys sound was dubbed “The Big Music” after a song on their second album, A Pagan Place. This musical style was described by Scott as “a metaphor for seeing God’s signature in the world.” It either influenced or was used to describe a number of other bands, including Simple Minds, The Alarm, In Tua Nua, Big Country, theHothouse Flowers and World Party, the last of which was made up of former Waterboys members. In the late 1980s the band became significantly more folk influenced. The Waterboys eventually returned to rock and roll, and have released both rock and folk albums since reforming. Their songs, largely written by Scott, often contain literary references and are frequently concerned with spirituality. Both the group and its members’ solo careers have received much praise from both rock and folk music critics, but The Waterboys as a band has never received the commercial success that some of its members have had independently. Aside from World Party, The Waterboys have also influenced musicians such as Eddie Vedder, Johnny Goudie, Colin Meloy ofThe Decemberists, Grant Nicholas of Feeder, James Marshall Owen,and Miles Hunt of The Wonder Stuff; both Bono and The Edge from U2 are fans of the band. Two years later the Vulcans were withdrawn from service and today only one, XH558, still flies. This is owned by the Vulcan to the Sky Trust, which returned XH558 to the air in 2007. 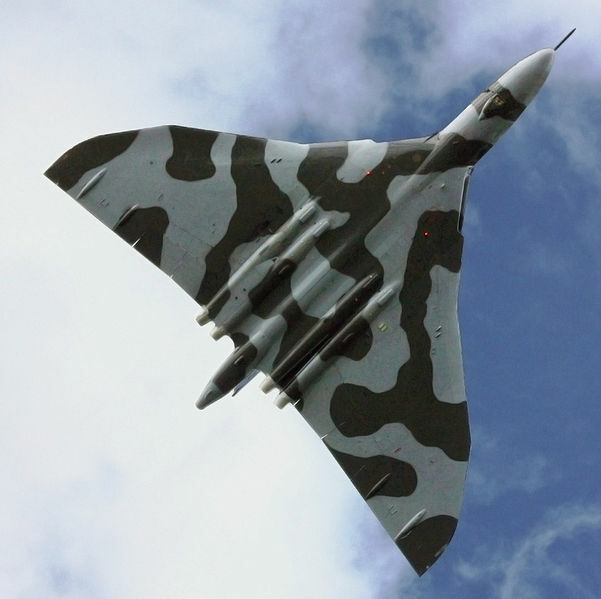 Since then the charity has managed to display the Vulcan at numerous airshows, which attract up to seven million people (including me) annually. Now Airshow organisers talk about ‘the Vulcan Effect’ and have also described the aircraft as a national treasure.” AVro Vulcan XH558 (civil aircraft registration G-VLCN) The Spirit Of Great Britain is the only airworthy example of the 134 Avro Vulcan V bombers that were operated by the Royal Air Force from 1953 until 1984. Vulcan XH558 served with the RAF between 1960 and 1985 in the bomber, maritimereconnaissance and air-to-air refuelling roles. The second episode of the new series of Doctor Who sees The Doctor (Peter Capaldi) saving a woman named Journey Blue, who is a crew member of the medical spaceship Aristotle which is parked on an asteroid. Once safely aboard the Aristotle the Doctor encounters a familiar adversary which has been rescued by the crew and is badly damaged and behaving very oddly. Elsewhere Clara meets new teacher Danny Pink (Samuel Anderson) at Coal Hill school where she teaches and has a heart to heart with the Doctor to clear the air, Journey Blue also asks to accompany the Doctor and Missy the Gatekeeper of the Nethersphere (Michelle Lopez) reappears briefly. The Late, great actor, Producer, Director and entrepreneur Richard Samuel Attenborough, Baron Attenborough, CBE would have celebrated his birthday 29 August had he not tragically passed away August 25 2014. Born 29 August 1923, Richard was the elder brother of David Attenborough, the naturalist and broadcaster, and the late John Attenborough, who was an executive at Alfa Romeo before his death in 2012. In the late 90’s he appeared as Sir William Cecil in the historical drama Elizabeth (1998), Jacob in Joseph and the Amazing Technicolor Dreamcoat and as “The Narrator” in the film adaptation of Spike Milligan’s comedy book Puckoon (2002). He made his only appearance in a Shakespeare film when he played the British ambassador who announces that Rosencrantz and Guildenstern are dead at the end of Kenneth Branagh’s Hamlet (1996). Between 2006 and 2007 Attenborough spent time in Belfast, Northern Ireland, working on his last film Closing the Ring, a love story set in Belfast during the Second World War and starring Shirley MacLaine, Christopher Plummer and the late great Pete Postlethwaitte.He is also he former President of the Royal Academy of Dramatic Art (RADA). He won two Academy Awards for Gandhi in 1983 and has also won four BAFTA Awards and three Golden Globe Awards. As an actor he is perhaps best known for his roles in Brighton Rock, The Great Escape, 10 Rillington Place, Miracle on 34th Street and Jurassic Park. After 33 years of dedicated service as President of the Muscular Dystrophy campaign, Attenborough became the charity’s Honorary Life President in 2004 and they also, established the Richard Attenborough Fellowship Fund.Attenborough is also the patron of the United World Colleges movement and frequently visited the United World College of Southern Africa (UWCSA) Waterford Kamhlaba. With his wife, they founded the Richard and Sheila Attenborough Visual Arts Centre. He also founded the Jane Holland Creative Centre for Learning at Waterford Kamhlaba in Swaziland in memory of his daughter. He passionately believes in education. Waterford was one of his inspirations for directing Cry Freedom.He was elected to the post of Chancellor of the University of Sussex on 20 March 1998, replacing The Duke of Richmond and Gordon. He stood down as Chancellor of the university following Graduation in July 2008. He was also a lifelong supporter of Chelsea Football Club, And served as a director of the club from 1969–1982 and between 1993 and 2008 held the honorary position of Life Vice President. On 30 November 2008 he was honoured with the title of Life President at the club’s stadium, Stamford Bridge. He was also head of the consortium Dragon International Film Studios, which was constructing a film and television studio complex in Llanilid, Wales, nicknamed “Valleywood”.